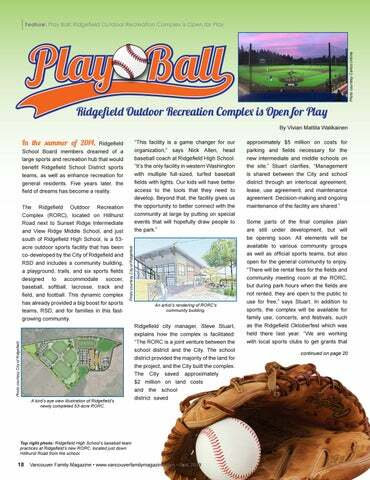 The Ridgefield Outdoor Recreation Complex (RORC), located on Hillhurst Road next to Sunset Ridge Intermediate and View Ridge Middle School, and just south of Ridgefield High School, is a 53acre outdoor sports facility that has been co-developed by the City of Ridgefield and RSD and includes a community building, a playground, trails, and six sports fields designed to accommodate soccer, baseball, softball, lacrosse, track and field, and football. This dynamic complex has already provided a big boost for sports teams, RSD, and for families in this fastgrowing community. Ridgefield School Board members dreamed of a large sports and recreation hub that would benefit Ridgefield School District sports teams, as well as enhance recreation for general residents. Five years later, the field of dreams has become a reality. A bird’s eye view illustration of Ridgefield’s newly completed 53-acre RORC. An artist's rendering of RORC's community building. Top right photo: Ridgefield High School’s baseball team practices at Ridgefield’s new RORC, located just down Hillhurst Road from the school.